Bref, HOW TO TRAIN YOUR DRAGON - THE HIDDEN WORLD figure parmi les plus belles réussites récentes du cinéma d'animation américain. De la guimauve pour les enfants. 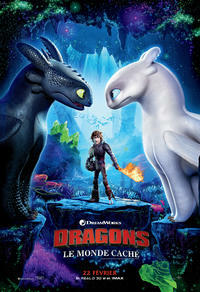 Dazzling animation, light-on-its-feet humor and a ton of heart bring the 'Dragon' trilogy to a thrilling end. The film's breathtaking images provide a fitting accompaniment to the characters' emotional struggles. Fans of the How To Train Your Dragon franchise couldn't have asked for a more satisfying sequel, as The Hidden World brings this family epic to an emotionally gorgeous close.